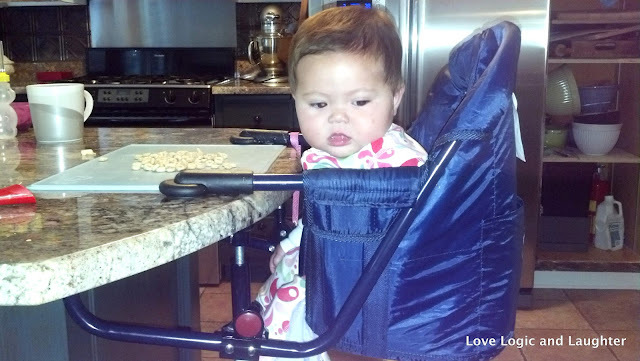 I love to let Eliana help when she is able to and when is a better time than in the kitchen? By watching me cook, she is becoming familiarized with the smells, sights and textures of foods while they are being chopped, steamed, baked, sauteed, toasted, food processed, etc. We are heavy on taste testing during the process. We feel as though if she is involved in the process then she is more willing to eat the food. 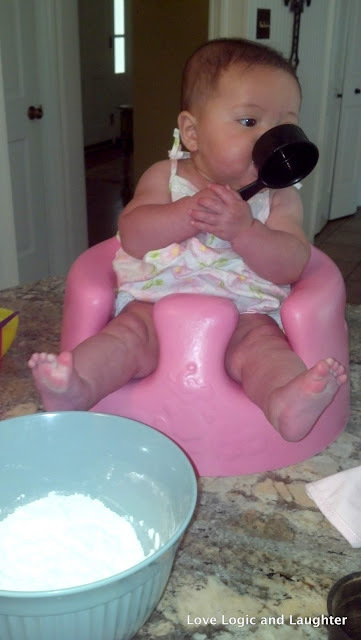 Rather than it mysteriously showing up on her high chair tray during meal times, she knows where it came from, and was in one way or another, part of the cooking process. Also, she then sees me cooking and is learning by example, how to provide balanced meal and snack options and develop a healthy mindset about food and how it is part of everyday life - the vegetables AND the cookies! It is all part of our attempt to create a positive mealtime environment and lifelong positive associations with foods. We keep two baskets of wooden velcro fruit and veggies and a variety of empty food/coffee containers on a shelf near the floor so that Eliana can always play and pretend cook while I am cooking in the kitchen. Even though Eliana is only 1 she is my "helper". If I use a whisk, then she uses a whisk. If I use a measuring cup, then she uses a measuring cup. If I stir a wooden spoon in a pot, then she stirs (or makes music) in a pot. Sometimes she helps while sitting in her chair at the counter. When she was younger she helped while in her bumbo. And most often she helps while sitting on the floor in the kitchen. Helping Mommy get an oven mit. We eat dinner at home most nights. That means I am cooking most days. For us, cooking for dinner usually happens in small spurts throughout the day. Meaning I chop the vegetables in one spurt, saute in another spurt and finish up late afternoon/evening. That way we aren't in the kitchen for 1.5 straight. Instead, while Eliana eats a snack I do part of it. If I am not done, then she becomes my "helper". We are silly in the kitchen. Mommy often times gets on the floor with Eliana.